Smak: Elegant, komplex, kryddig med integrerad fatkaraktär och lång eftersmak. Tillverkning: The brandies are distilled twice in copper pot stills without the addition of sugar, aroma or foreign alcohol. During the distillation process, the first highly potent “head” that begins to flow is discarded, as is the concluding “tail” of the distillation that contains impurities. It is only the heart of the first distillation, also called “low wines” that are distilled a second time. The highly aromatic and concentrated “heart” of the second distillation is the fine brandy that is matured in small oak barrels for several years. Övrigt: The Domäne Wachau established a distillery on its premises in 1965 and has practiced the fine craft of distillation ever since. The long tradition of distilling spirits at Domäne Wachau makes it possible to offer brandy specialties that have matured for many years in wooden casks. It is possible to book the Domäne Wachau Distillery as a venue for events and tastings. 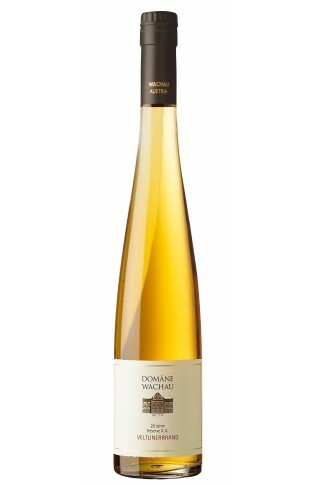 The grape variety Grüner Veltliner is particularly well suited for the production of multi-layered brandy. When these grapes are harvested early, they yield a light wine with high acidity. The low sugar content requires a long and slow distillation that results in an exquisite brandy with well-integrated alcohol content. This rare distillate is highly concentrated and flavourful with plenty of fruit and spice.